"Run to the goal by navigating a series of spinning checkpoints." "Slow and steady! Watch which way the checkpoints spin before entering one." Spin Doctor is a Duel minigame in Mario Party 7. A spin doctor is someone working in media who tries to sway public opinion one way or the other. 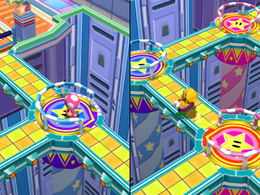 The player needs to run through a grid of bridges with a spinning platform at every intersection. Blue platforms spin all the way around, and red ones make a partial rotation. The first person to get to the end wins. This page was last edited on August 4, 2017, at 22:01.